Choosing paint colors can be a tricky - but crucial - part of any home's interior design. And it can be deceivingly difficult. You might see a color in a painting and fall in love with it but matching that color is another story. Or you spot a color in someone else's home but it doesn't look quite as good in your own. Or you ask someone what that beautiful color is and they tell you white (and there are hundreds of "white" paint colors so good luck there). Every day, we receive dozens of questions about paint colors we have used in our design projects. In today's blog post, we are talking a little about paint color details for some of those most popular rooms along with a few tips on how to choose paint colors for your own home. Let's start with this gorgeous white kitchen. This entire kitchen was painted in one color but with different finishes. 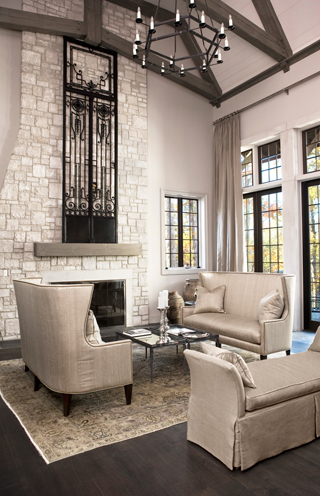 We are big believers that neutral colors are a great backdrop when it comes to the color of a room. Given the open layout of this home, using one color throughout kept the rooms connected and made the overall flow of the house better. For this next kitchen, we also went with white but used a few different shades along with dark interior door framing to provide contrast and interest. Beige can sometimes be a tricky paint color. Neutral colors have various undertones; they can have shades of blue, yellow, red, and the like. In order to use the right beige or tan in a space, it is important to consider the lighting and the undertones of the furnishings and other room design elements to ensure everything complements one another instead of clashing. When it comes to undertones, you should also keep in mind the type of room and overall perception of temperature when selecting paint colors. For rooms that you want to relax in or experience calm like a bedroom, choose paint colors with coolor undertones. For rooms where you want to feel energized, go with paint colors with warmer undertones like work spaces or workout rooms. In rooms where you want to feel 'cooler' such as a sunroom that is Southern facing, go with paint colors with cooler undertones as well. Neutral colors don't necessarily mean just beige or tan. Shades of gray are also neutral in that they are extremely versatile. The gray walls in this living room complement the wood ceiling beams and the dark interior frame of the windows. Additional furnishings like the dark antique door over the mantle also complement the cool gray paint color. By choosing the same shade of paint for the walls, ceilings and casings, the room feels more lofty and open. In some cases, using various paint colors in one room for ceilings and walls can make the room feel choppy and can break up the space too much. When it comes to painting the ceiling in a particular room, there are a few things to keep in mind when it comes to selecting a color. To lighten a dark space, a soft yellow, white or off white paint color will help reduce shadows. If you want your ceiling to attract attention, go with a lighter paint color. Dark-color ceilings tend to attract attention to your walls, furnishings and accessories in a room. Download these six tips from our design team to help you go about selecting the right paint colors for your own home. Do you have a favorite go-to paint color or color palette that you tend to use for your home?